Feast your eyes on these Flights of Fancy! 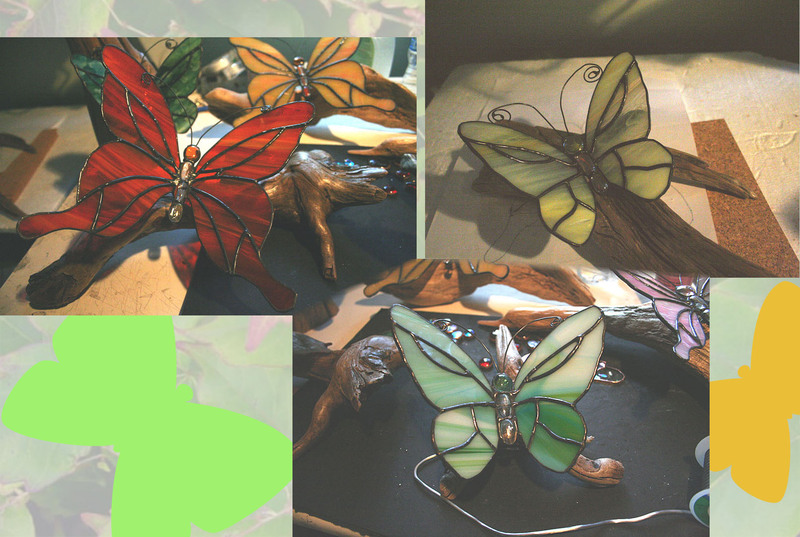 This is a sneak peak into Jane’s studio where there has been an infestation of beautiful butterflies settling on pieces of driftwood. Twenty-five to be precise. Jane has donated 25 table centre pieces (for auction) for the HHHS Auxilliary’s Italian Night plus a donation to the Arts Exposed annual event. Jane has been working on these for weeks and weeks. The butterflys are an original design and thanks to her “jumpin ladies” from exercise class Jane was able to amass some lovely driftwood pieces. We cleaned the driftwood & varathaned it while Jane was cutting, grinding, foiling, soldering, applying patina and polishing each piece. We estimated it takes about a full day to do one piece, all in. Thank goodness she loves glasswork. Jane’s been doing it for more than 20 years (she started at the age of 2) and still gets great pleasure out of seeing work well done. Her precision on all aspects is really beautiful to see. Her energy and commitment (and kind intentions) on these types of projects leaves me almost speechless . Well done my dear … and all for good causes.